The city of Nashville, known as the “Country Music Capital of the World,” has a diverse and deeply-rooted history that began well before its official founding on Christmas Eve 1779. From its bustling music scene, southern hospitality, and eclectic food, Nashville welcomes over 15 million visitors a year and is home to some of the nation’s most recognizable landmarks. 1. Downtown Presbyterian Church, built in 1851, is one of the few examples of Egyptian Revival architecture in America. 2. Nashville’s WSM radio station received the first FM radio license in 1941. Most listeners weren’t aware of the change beforehand, but they immediately took note of the clearer signal. 3. 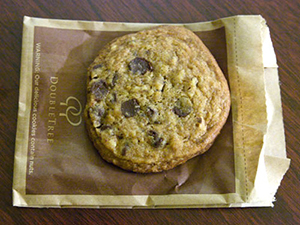 The DoubleTree Hotel cookies are made in Nashville and are, in fact, Christie’s Cookies – a famous Nashville cookie company. 4. The AT&T Tower downtown is nicknamed the ‘Batman Building’ due to its resemblance of bat ears. 5. Nashville has more than 180 live music venues throughout the city. Venues that play music four or more nights a week will have a guitar pick-shaped “Live Music Venue” sign. 6. Theodore Roosevelt coined the phrase ‘good to the last drop’ after drinking a cup of locally produced coffee in Nashville at the Maxwell House Hotel. 7. 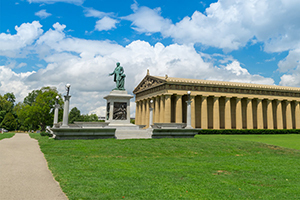 Centennial Park is home to the only replica of the Greek Parthenon. 8. Nashville is known for breeding some of history’s most famous racehorses. Nashville still honors Iroquois - the first American horse to win the English Derby in 1881 - by hosting the annual Iroquois Steeplechase on the second Saturday of May. Other famous horses bred at Belle Meade Plantation include War Admiral, Seabiscuit, and Secretariat. 9. Elvis recorded over 200 of his songs at RCA’s historic Studio Bon Music Row. A string of Christmas lights still hangs in the studio to this day. 10. 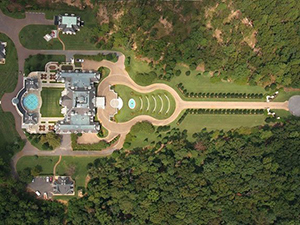 U.S.President Andrew Jackson’s Nashville home, The Hermitage, has a driveway shaped like a guitar.